Merry Christmas, Groove-ophiles! 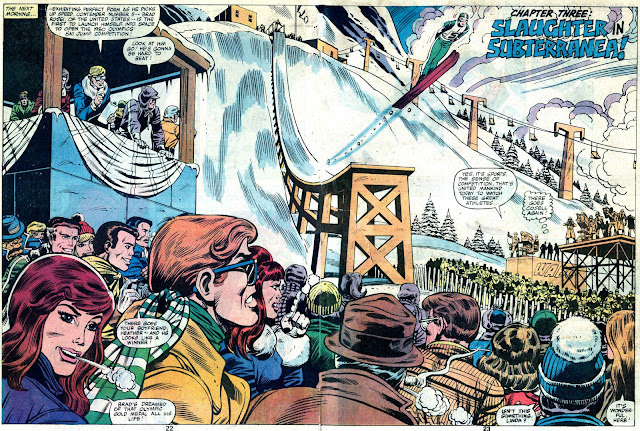 Hope you're enjoying a wonderful day with family and friends (whether you celebrate Christmas or not--everyone needs a wonderful day with family and friends, right?)! 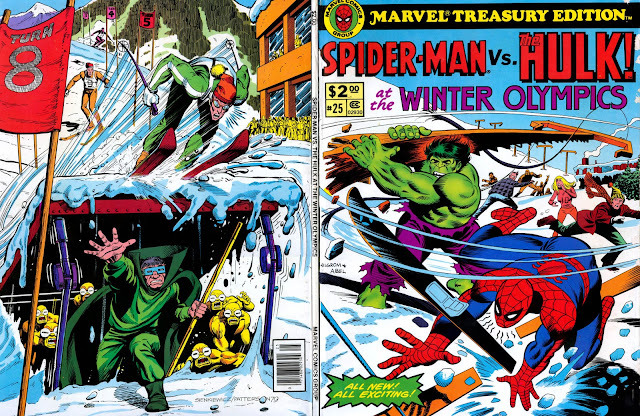 It's time to unwrap the big present--and I do mean big, since this story was first published in Marvel Treasury Edition #25 (December 1979)! 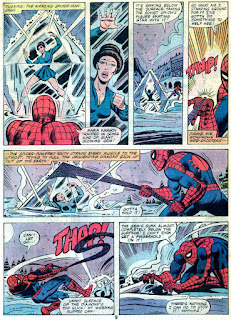 "Spider-Man Vs. 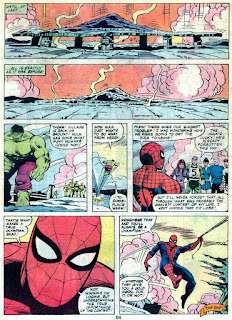 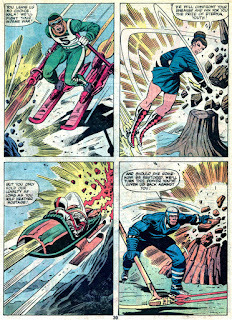 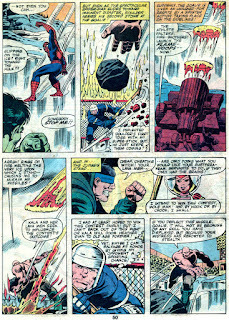 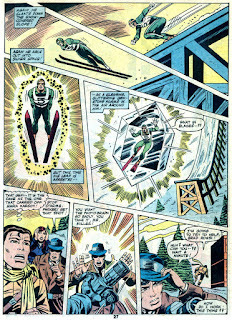 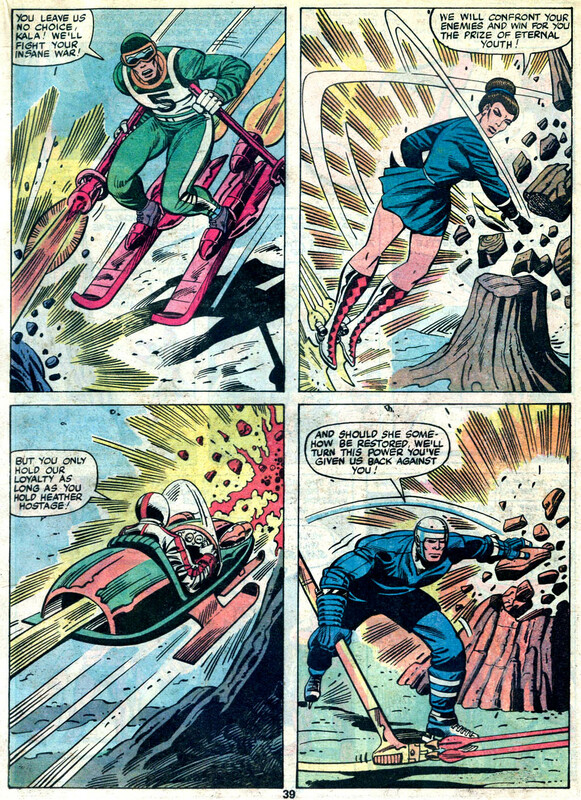 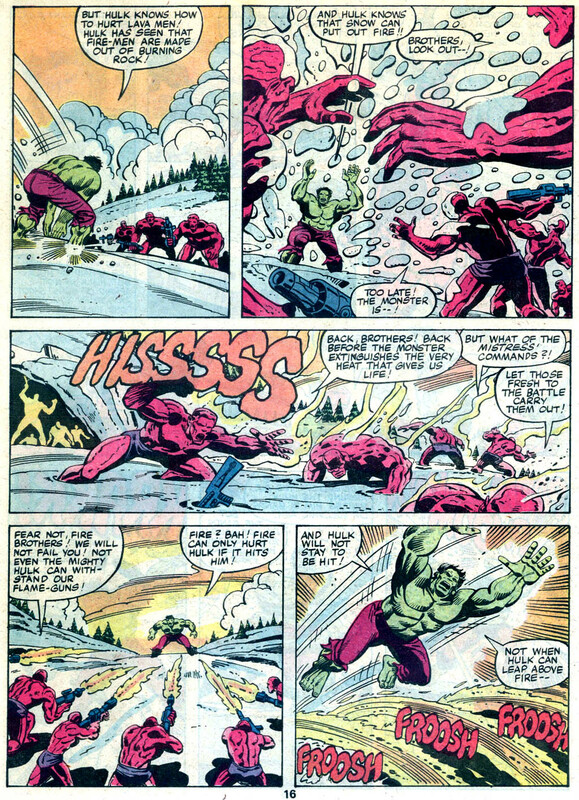 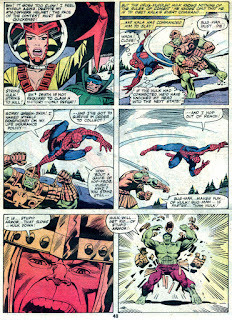 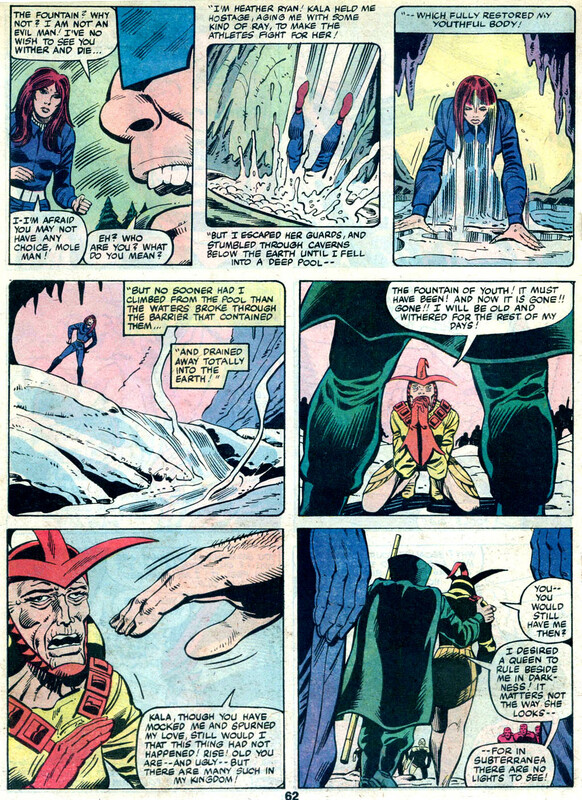 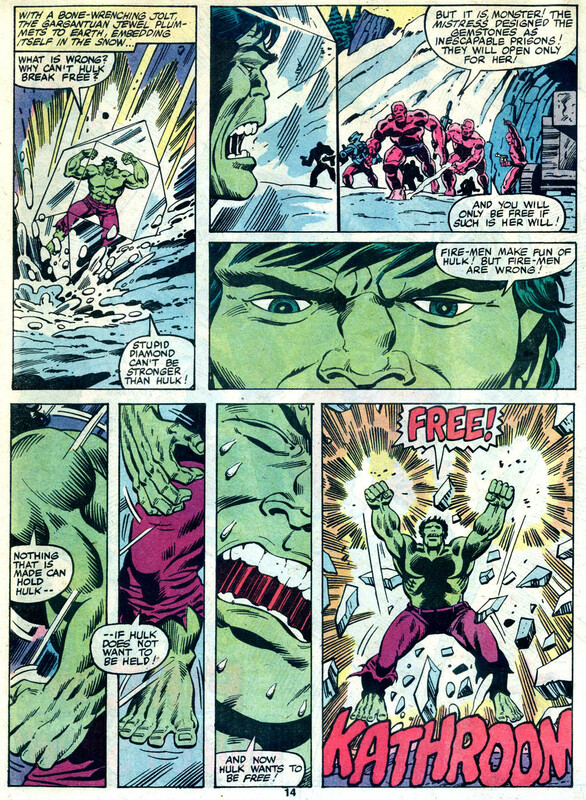 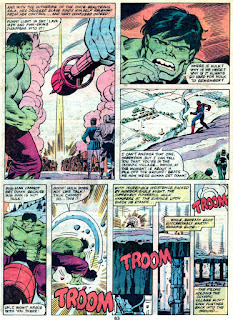 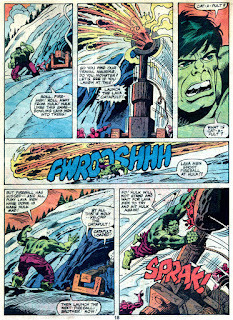 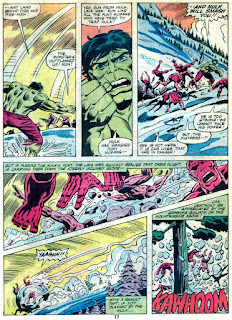 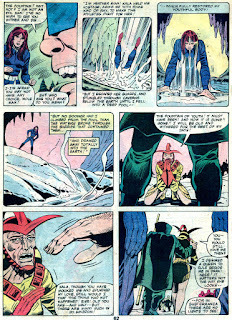 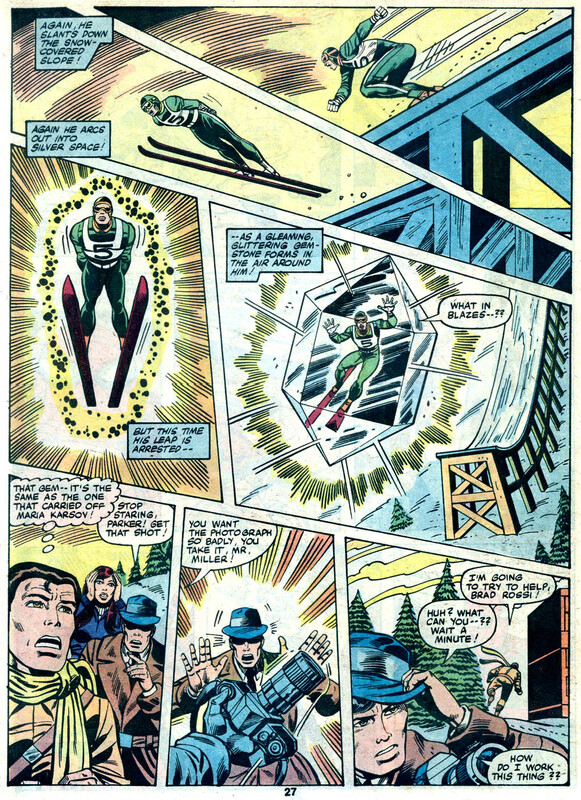 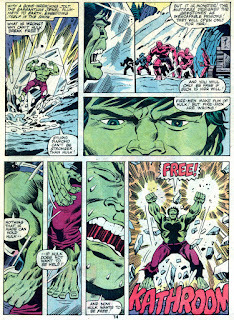 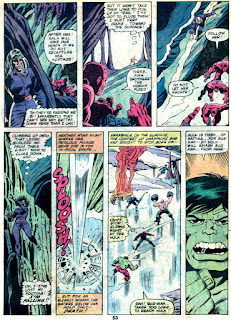 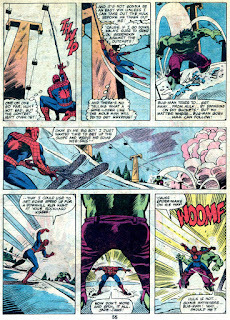 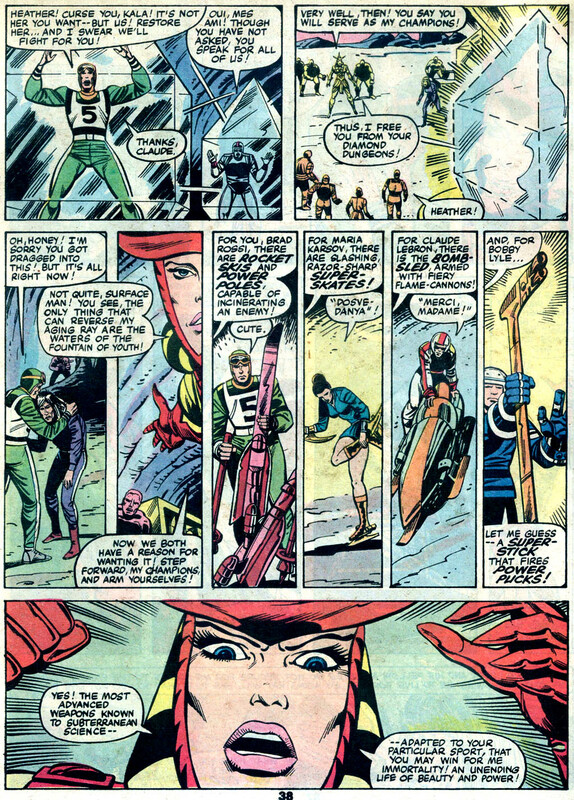 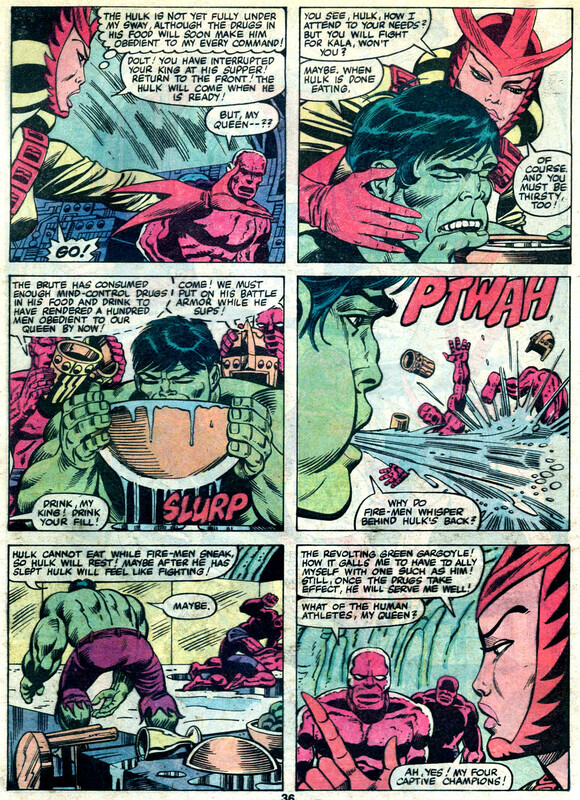 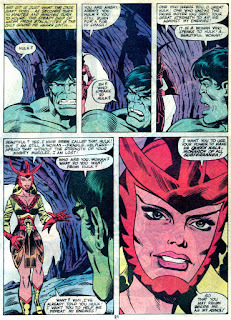 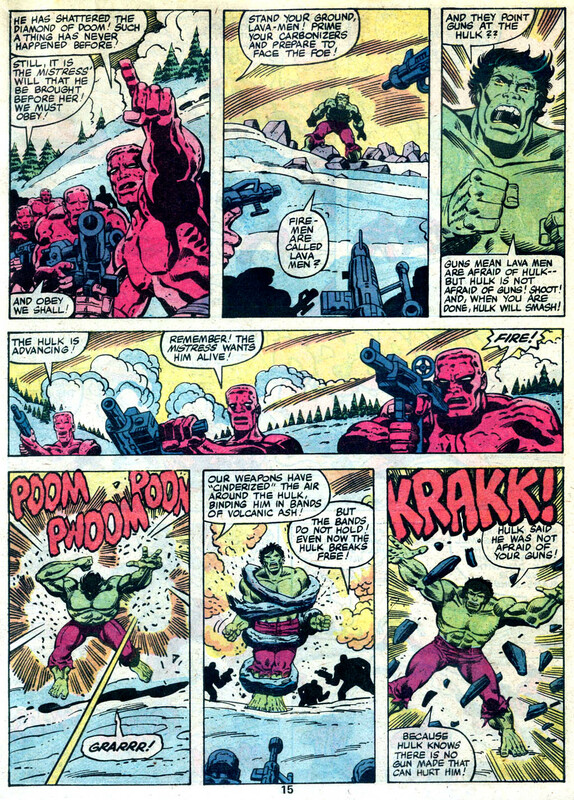 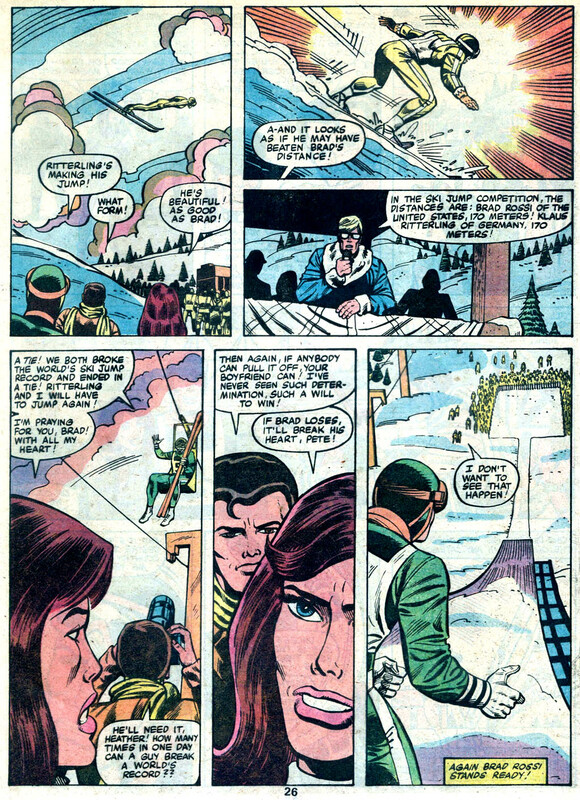 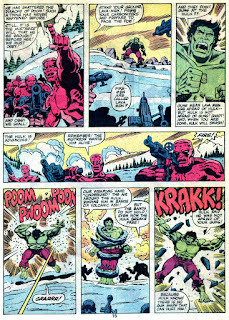 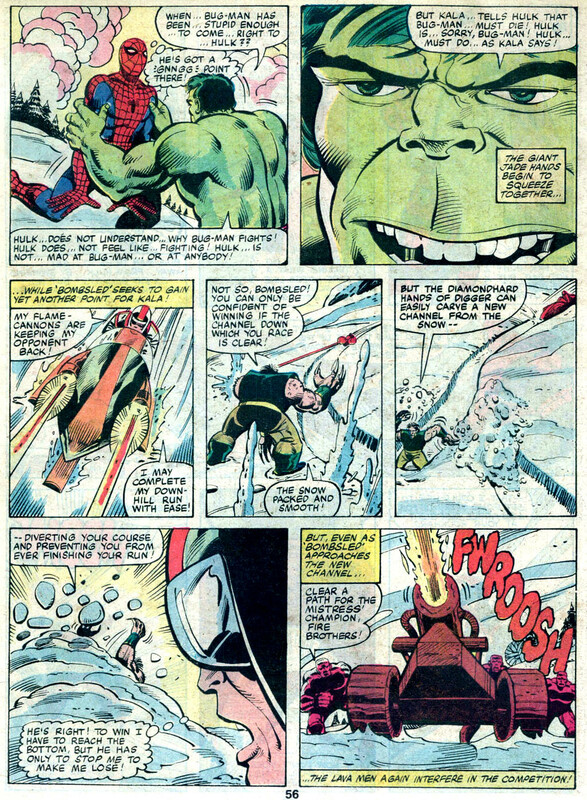 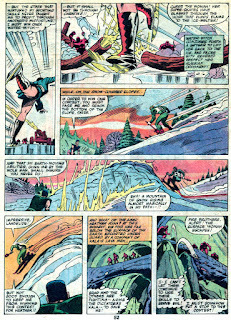 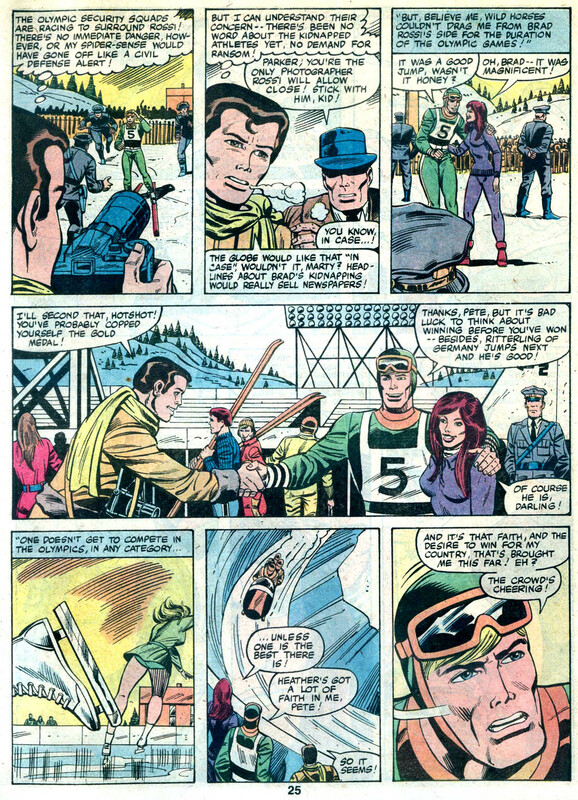 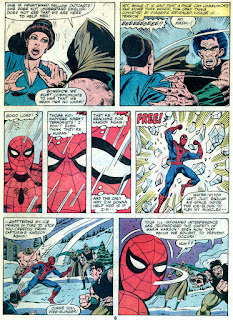 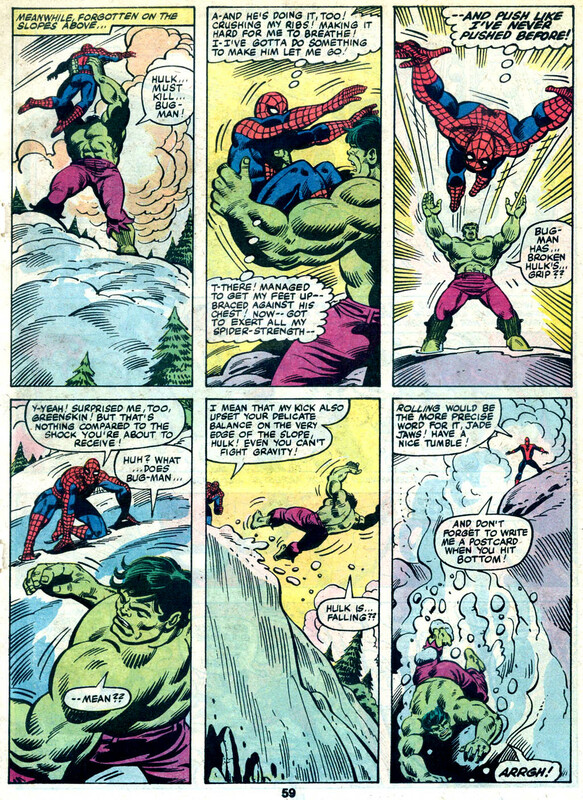 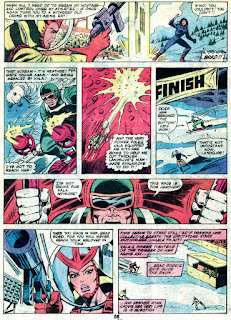 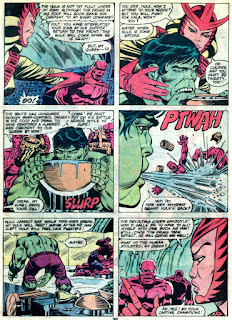 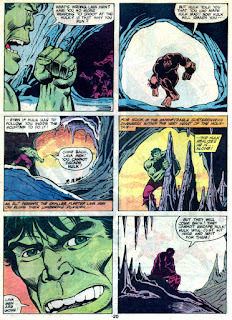 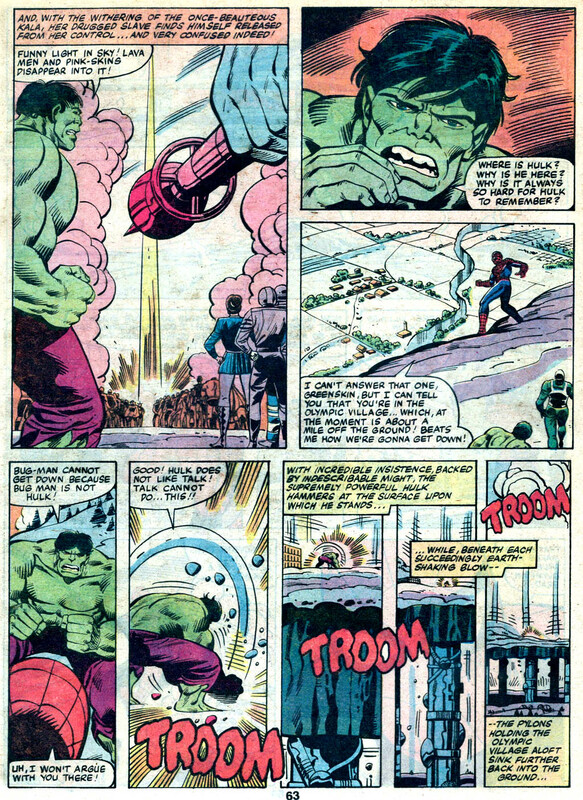 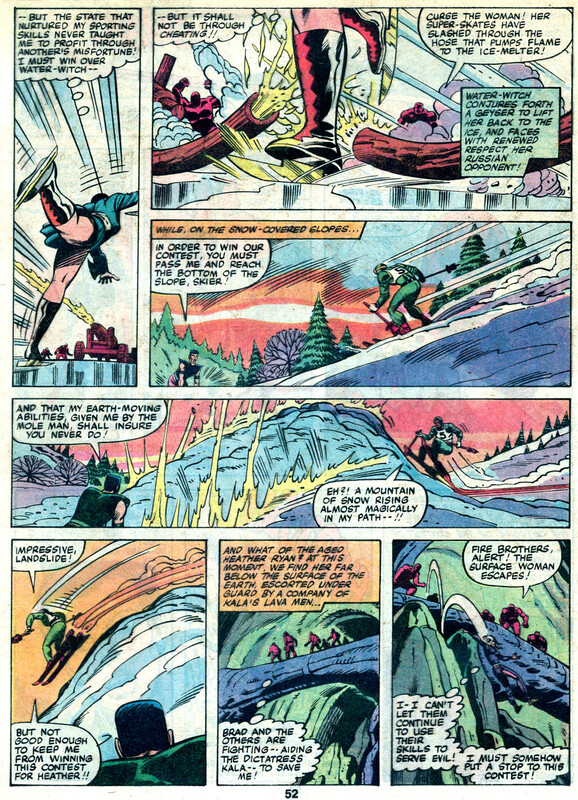 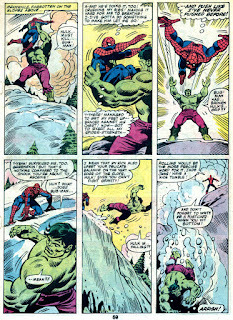 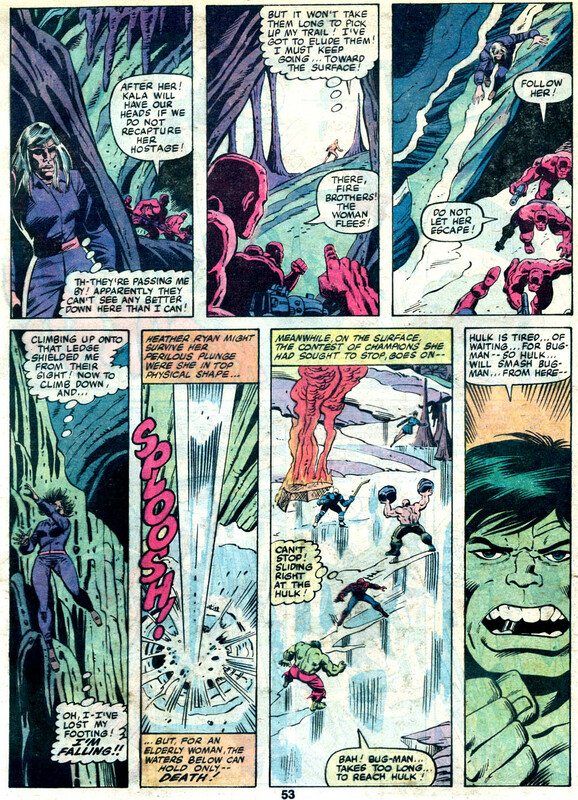 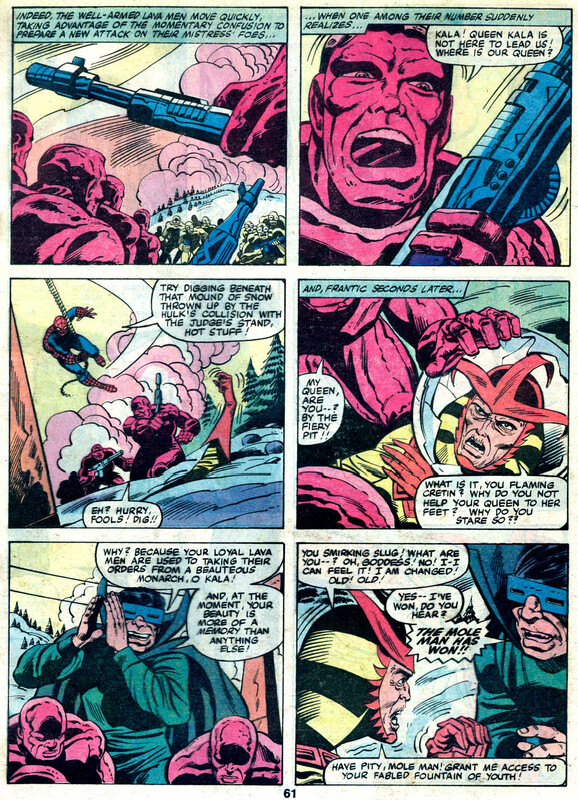 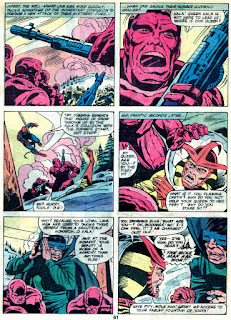 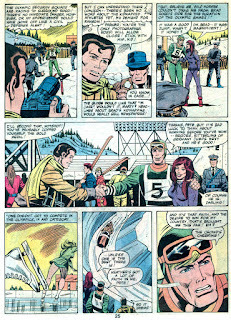 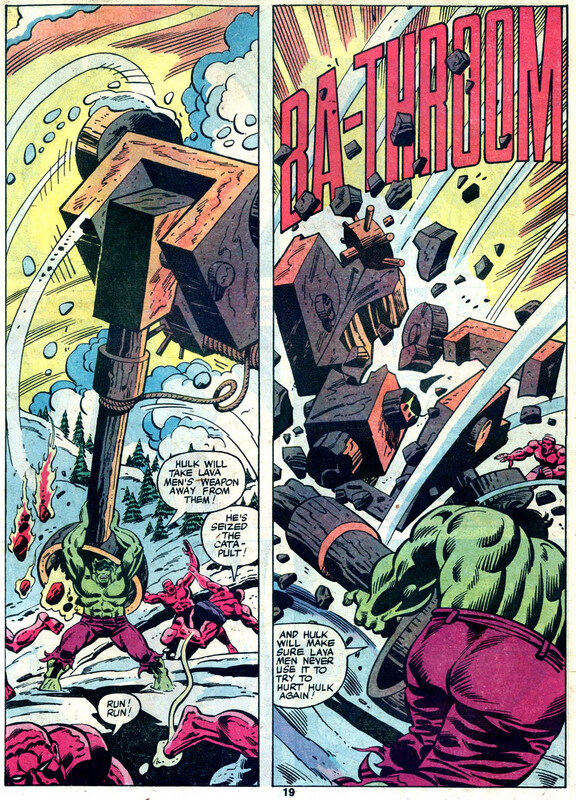 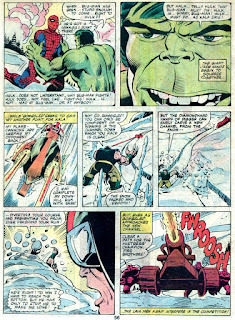 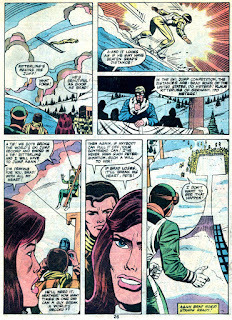 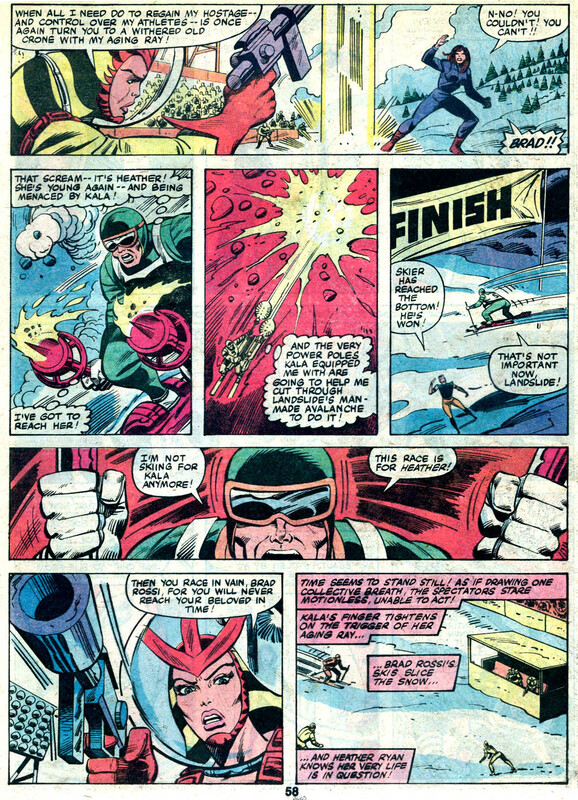 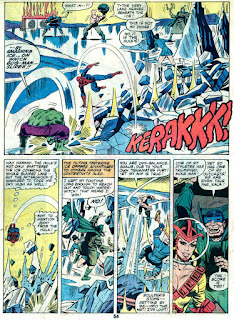 The Hulk at the Winter Olympics" was a 64 page, tabloid-sized extravaganza featuring Marvel's "TV heroes" at the 1980 Winter Olympics held at Lake Placid New York. 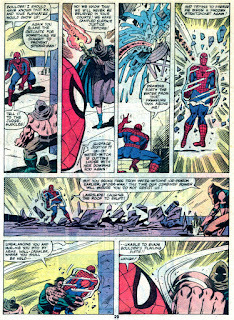 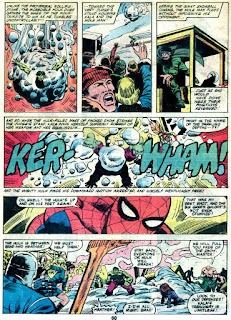 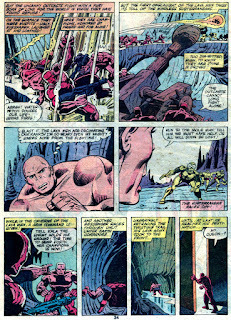 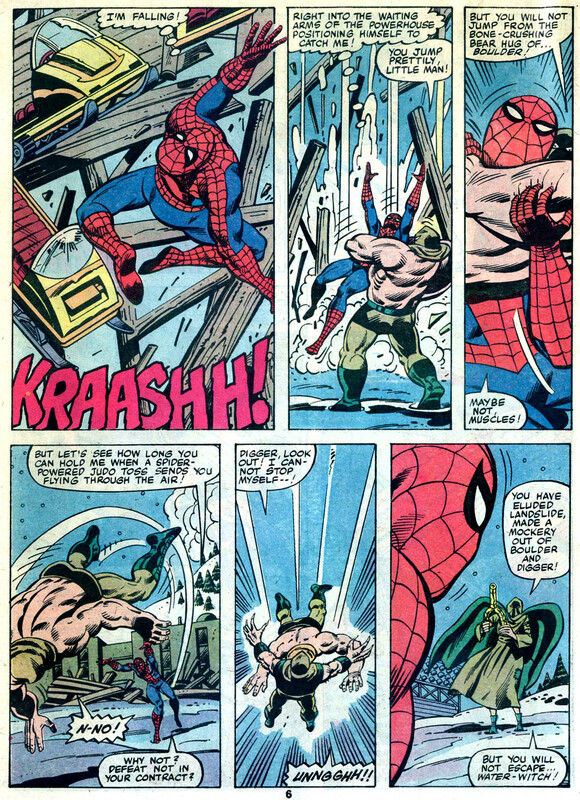 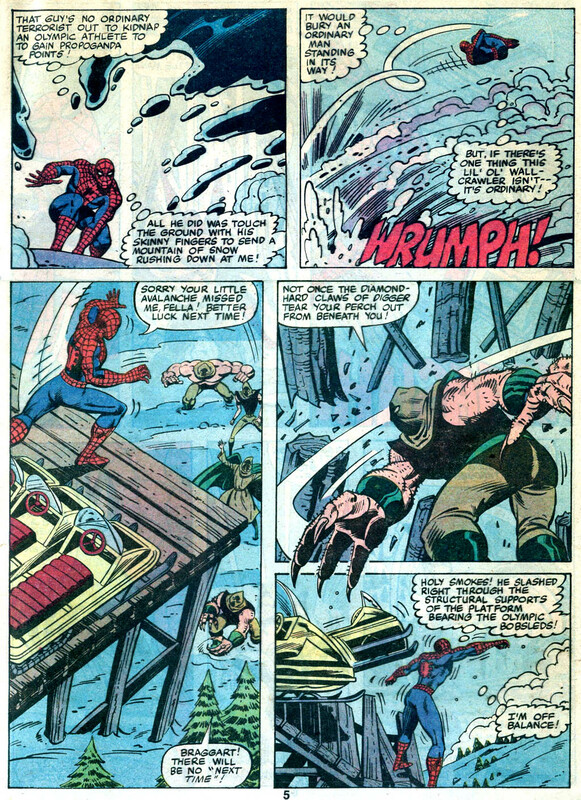 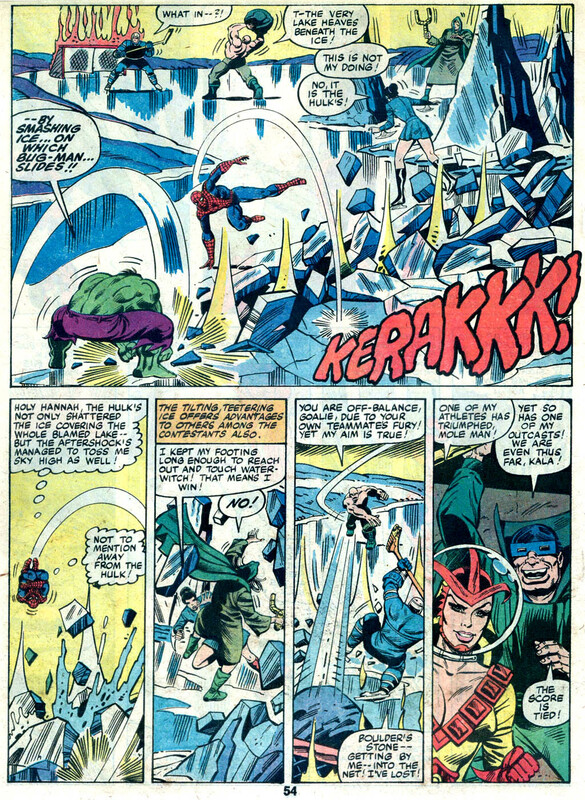 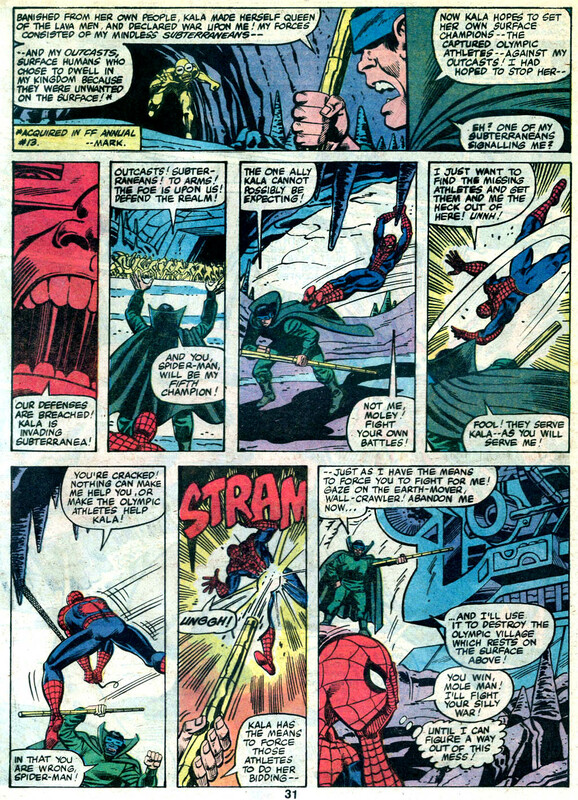 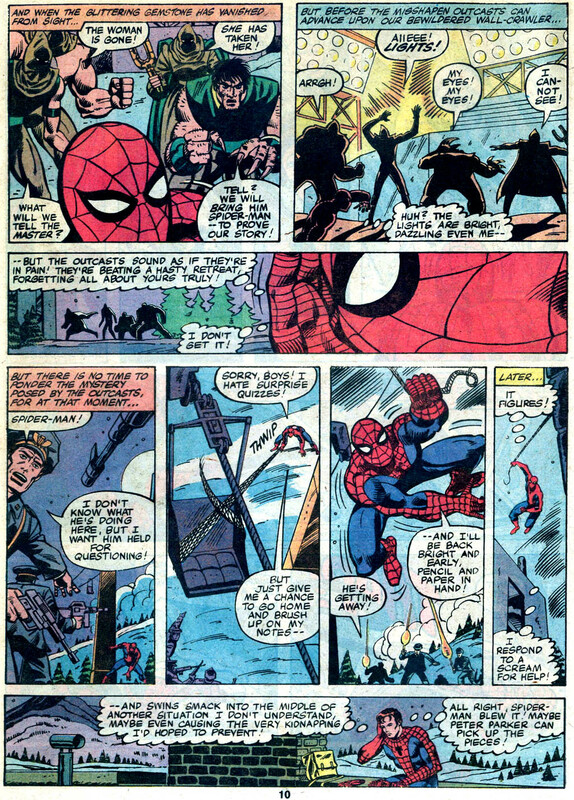 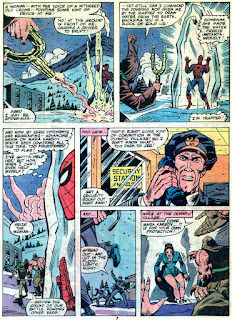 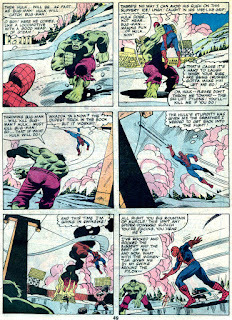 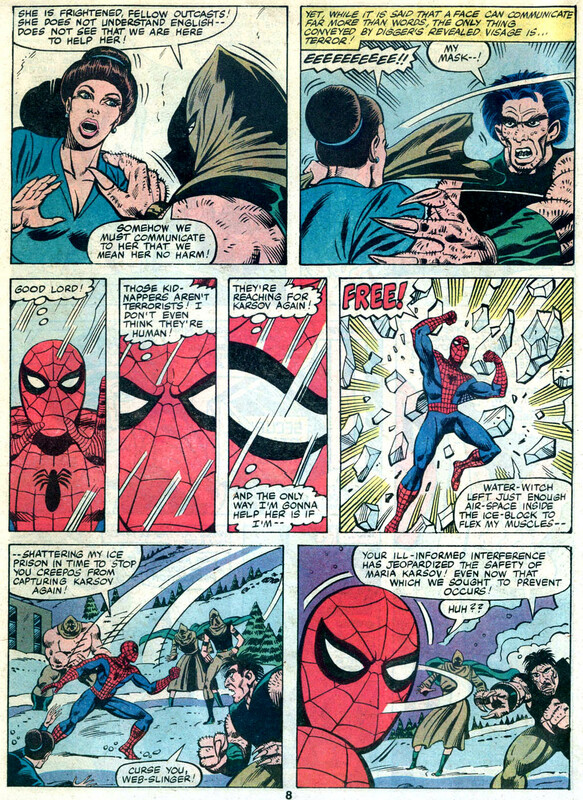 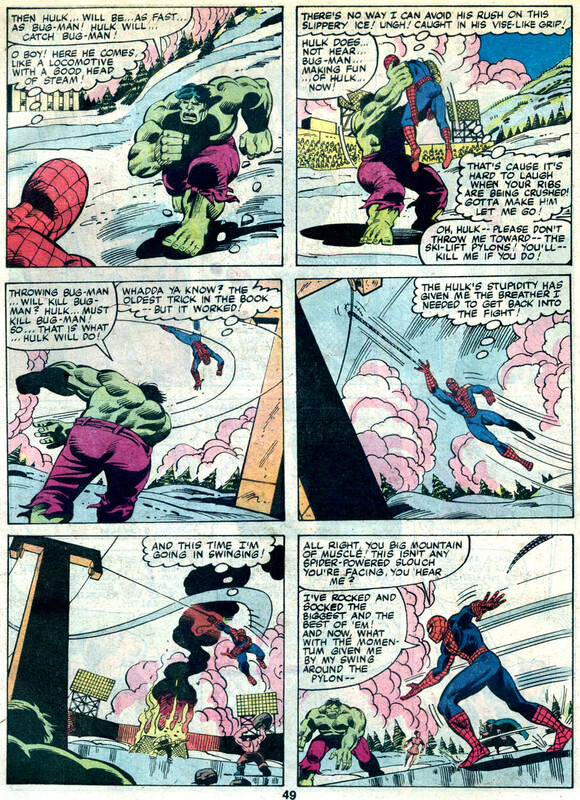 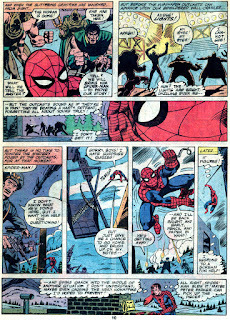 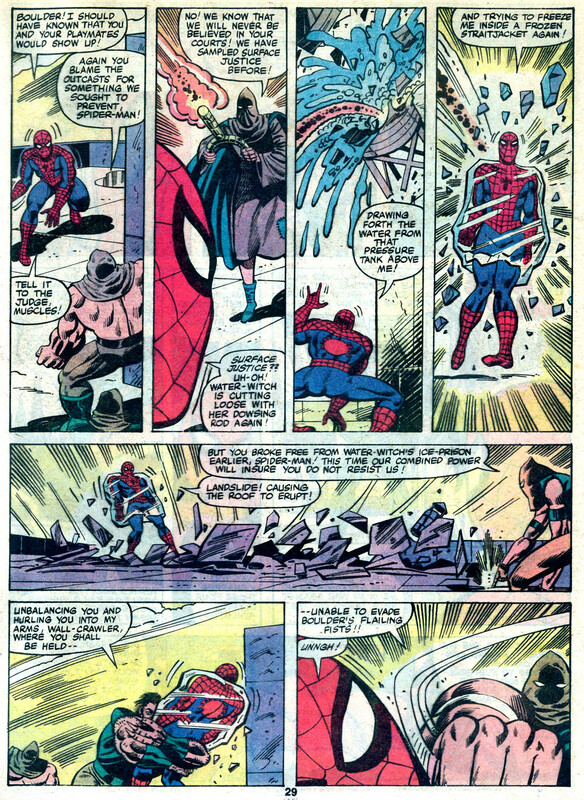 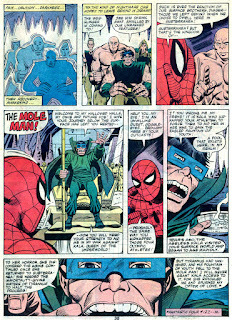 While Spidey and Greenskin did fight each other (Marvel style) near the end of the story, their main nemeses were the Mole Man, the Lava Men, Kala, and some new baddies with names like Landslide, Digger, Boulder, and Water Witch. 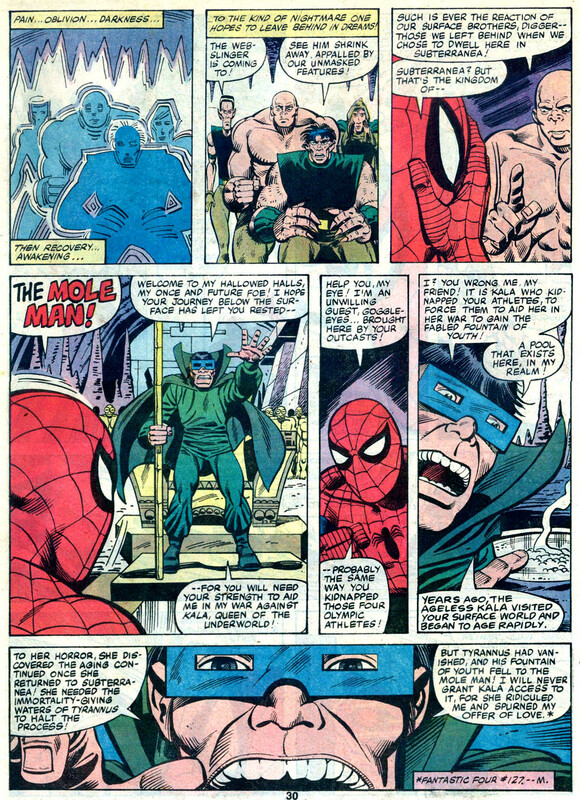 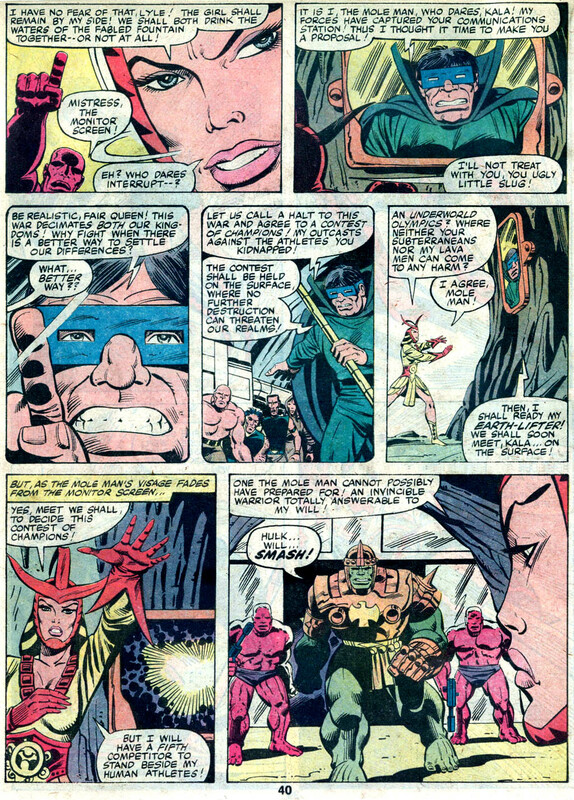 The whole magilla was a pretty cool idea as plotted by Mark Gruenwald, Steven Grant, and Bill Mantlo, and scripted by Mantlo. 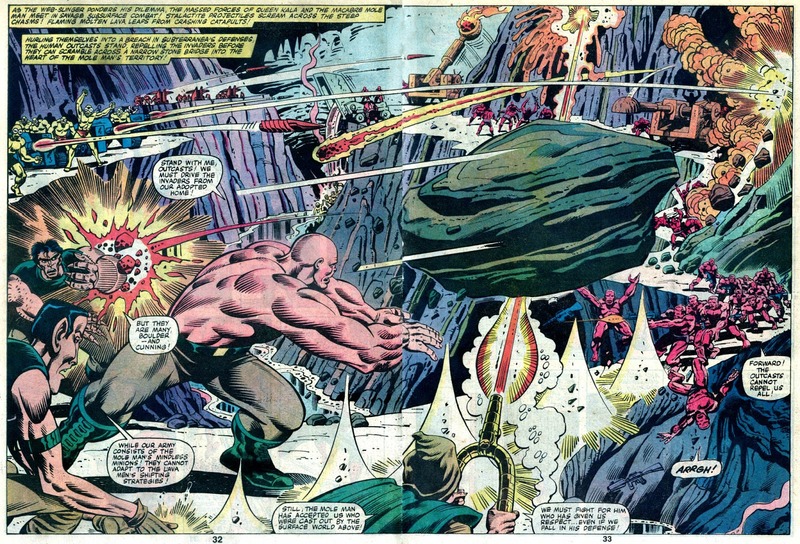 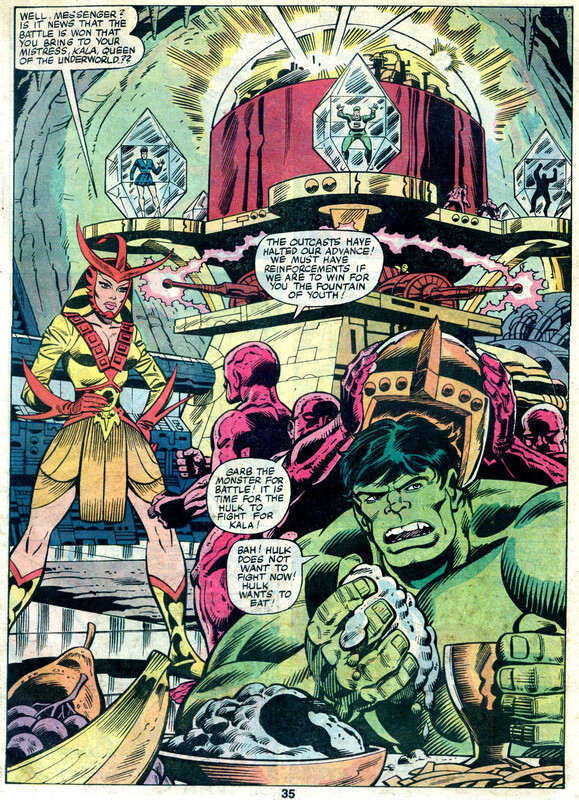 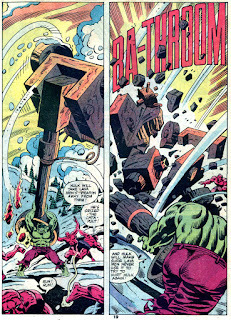 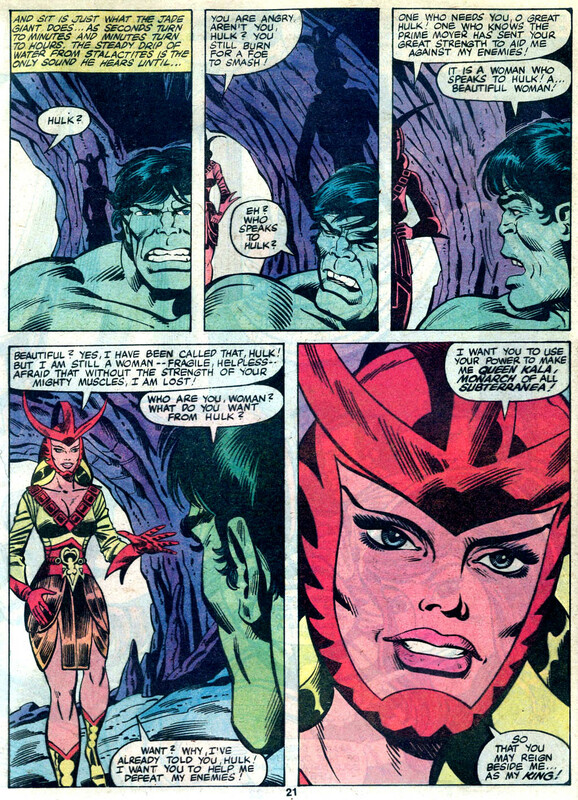 The art by Herb Trimpe and Bruce Patterson was solid, with some seriously sweet double-page spreads, taking advantage of that gi-normous printing size. 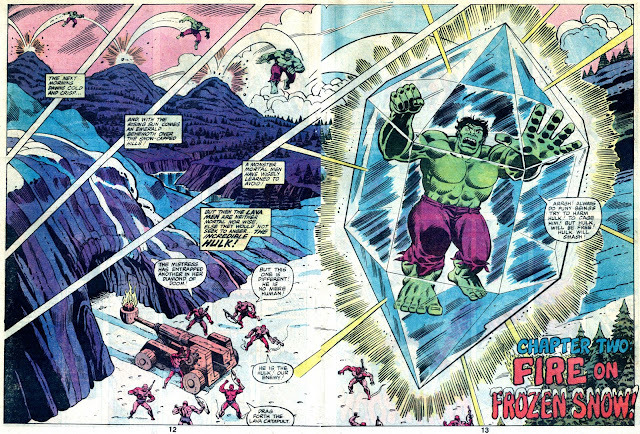 Rip off that wrapping paper and enjoy, Groove-ophiles! 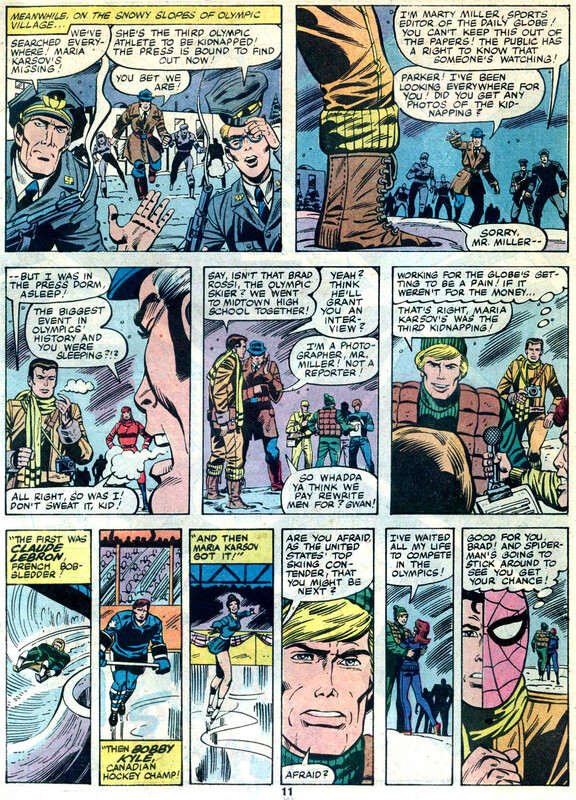 Can you pick out all the cameos on this page? 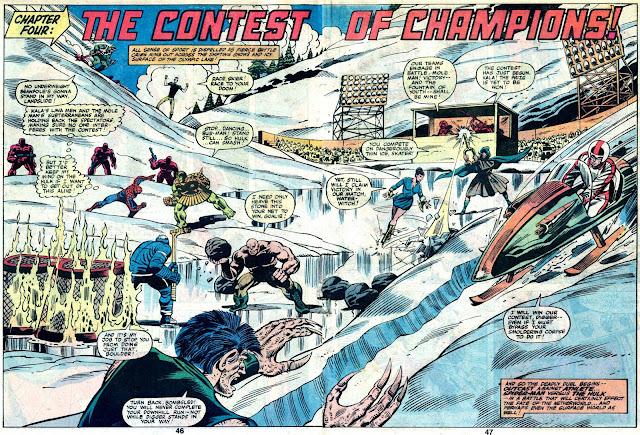 Too bad the Bullpen Gang didn't have a crystal ball, though--then they could have worked in The Miracle On Ice. 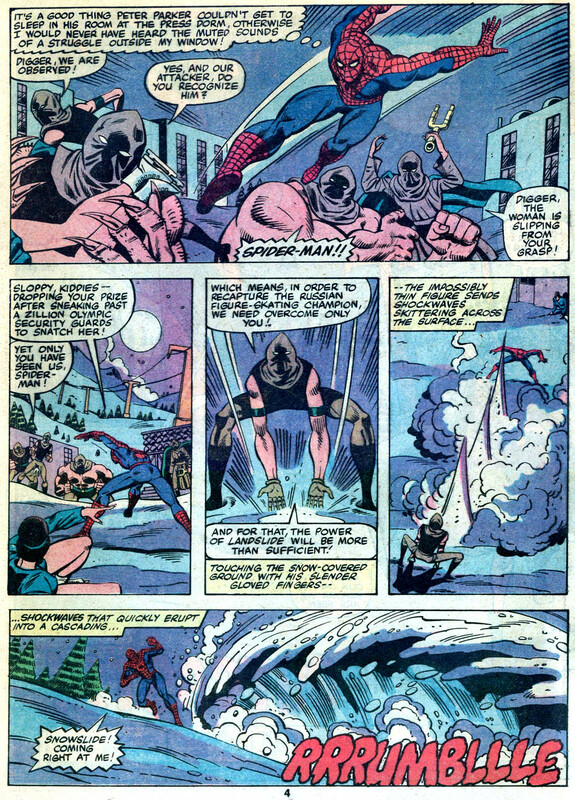 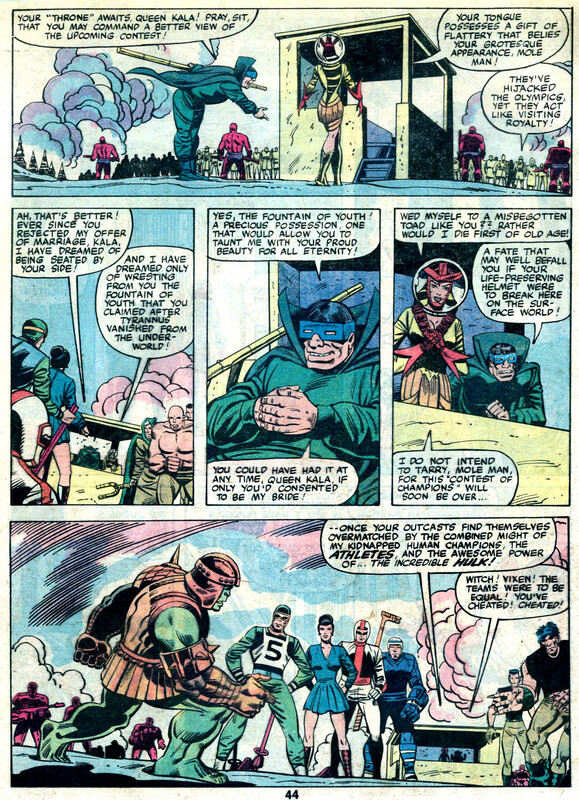 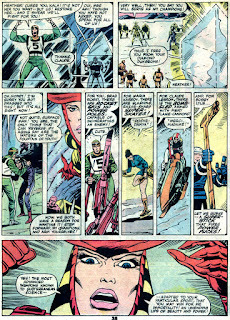 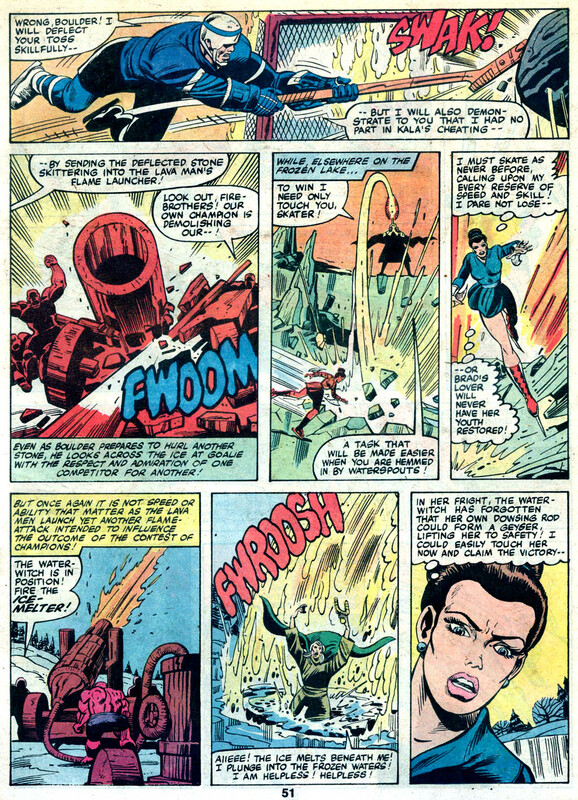 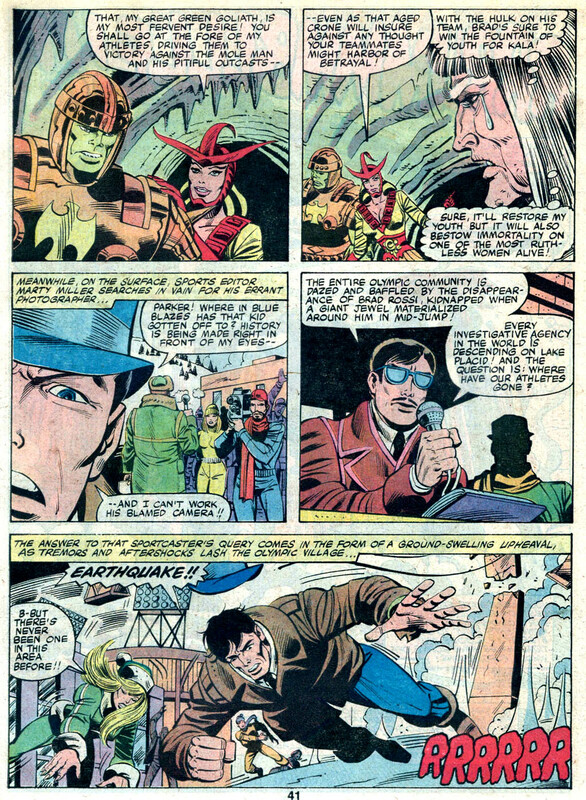 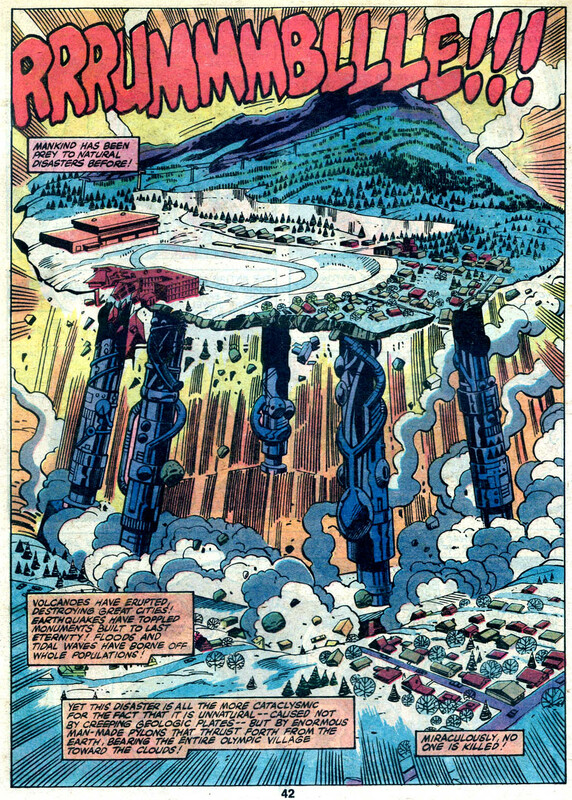 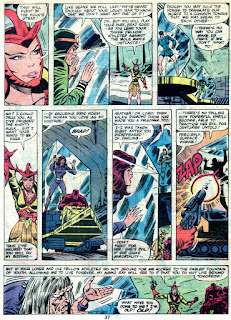 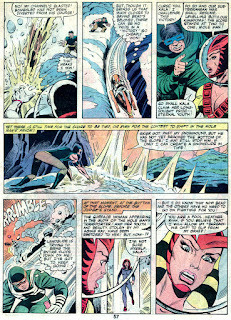 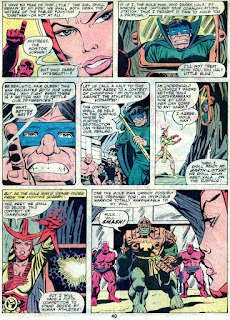 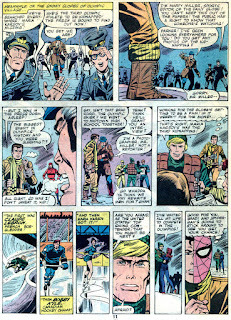 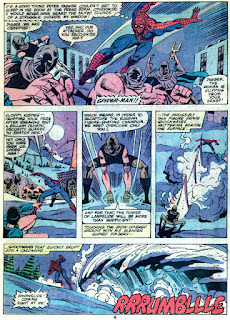 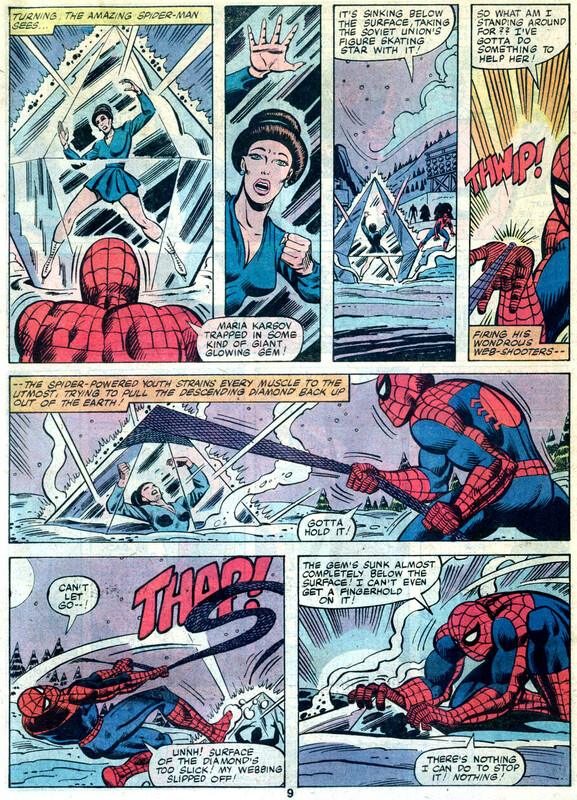 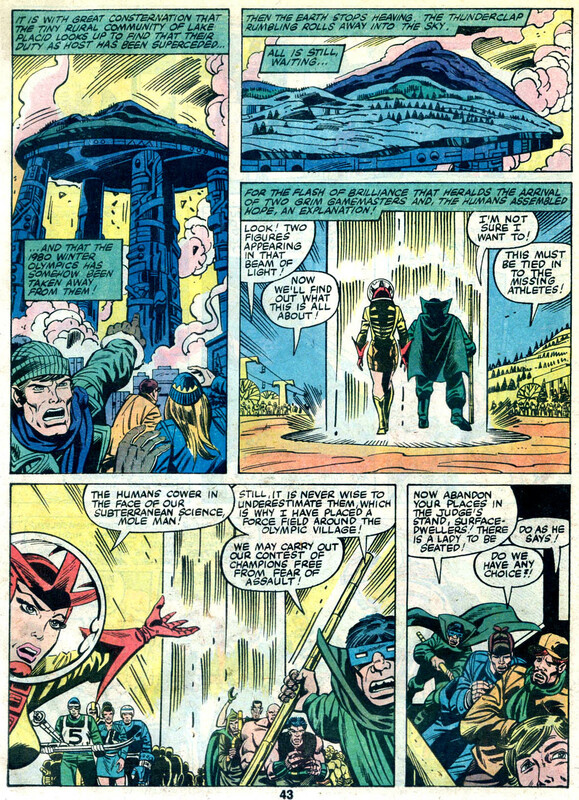 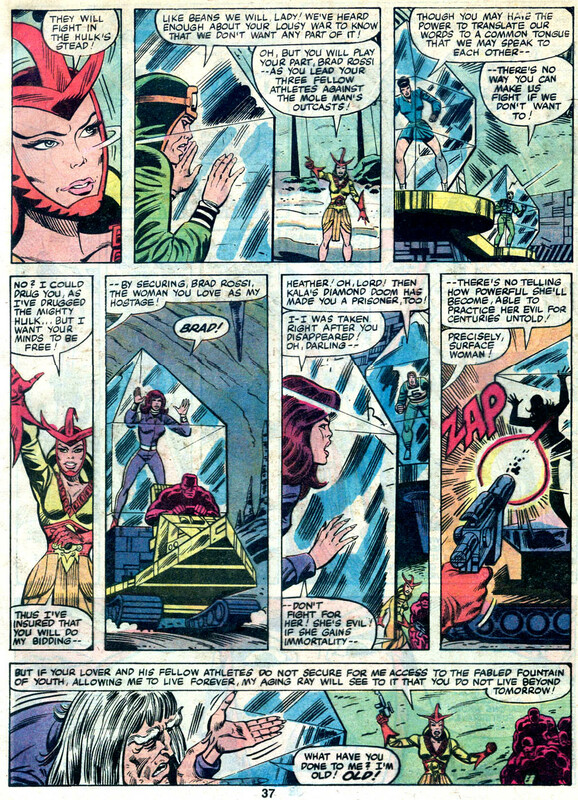 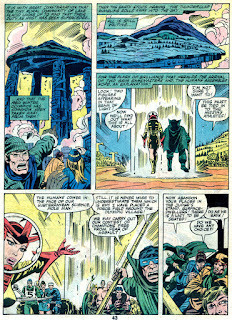 Of course, that self-same crystal ball might have warned them that President Carter was going to pull the U.S. out of the 1980 Summer Olympics--which would mean they wouldn't have created the Treasury Edition that was to become Marvel's first mini-series, Contest of Champions! 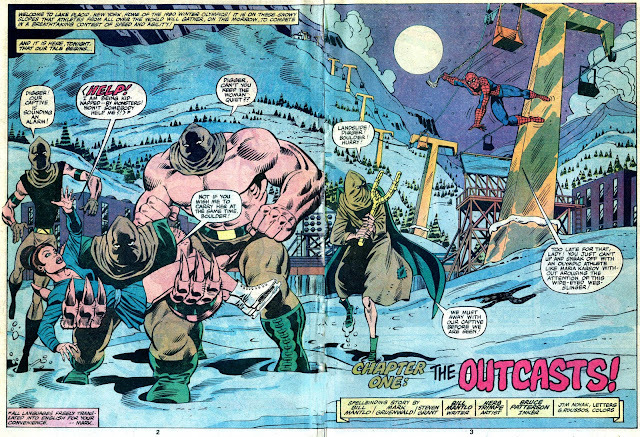 Oh, and they might have put Bill Sienkiewicz on the front cover instead of the back cover (no offense Al Milgrom and Jack Abel)! 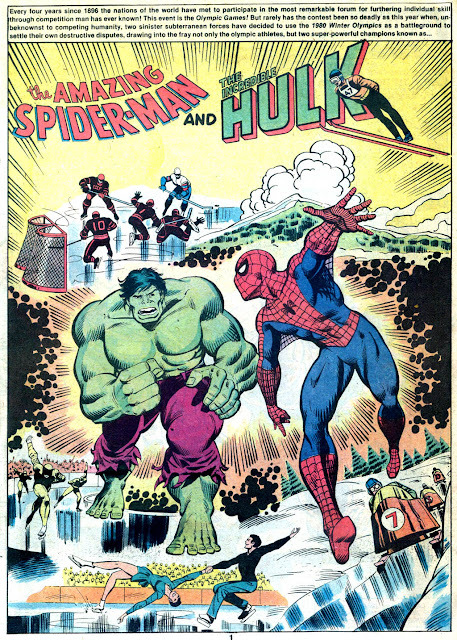 And have a holly, jolly day! Merry Christmas, Groove! Hope you enjoy the holidays to the fullest. 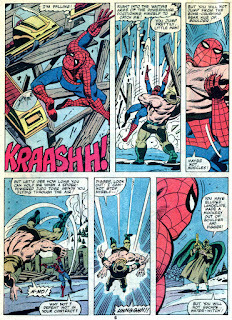 And thanks again for all of the wonderful stuff you post, and for this extravaganza. 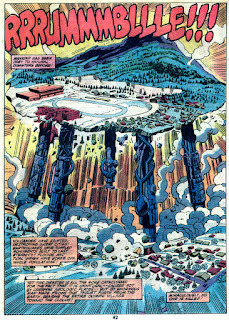 Never knew this existed. 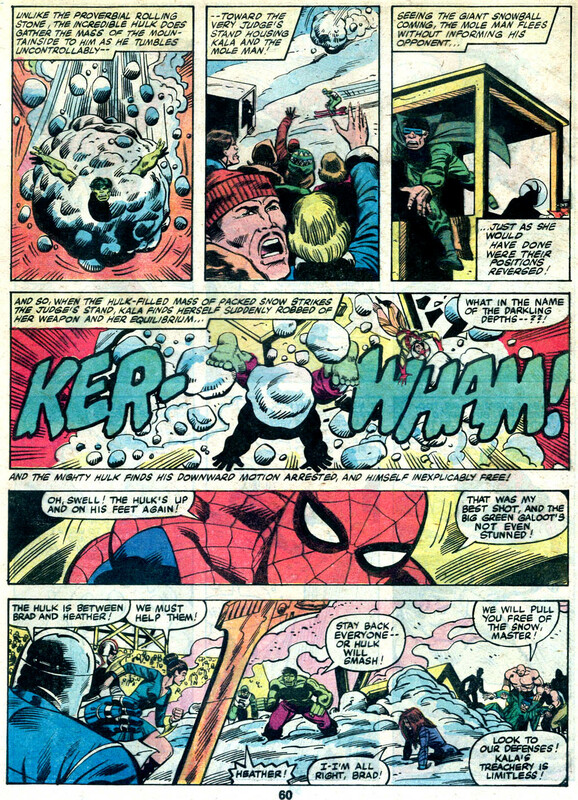 How'd I miss it? 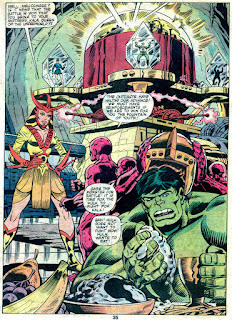 I was still collecting then, in those months before heading off to college. Maybe it looked silly to me at the time. 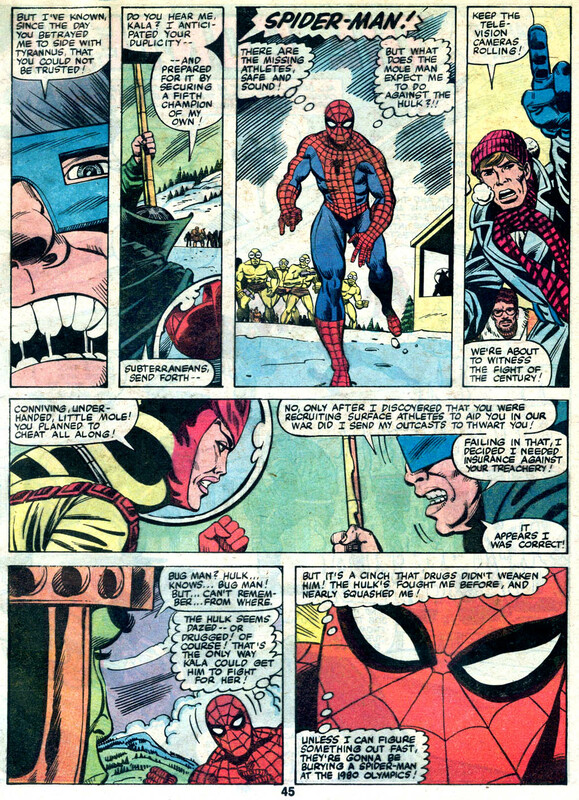 I love reading new old gems like these online, so thanks for all the opportunities! 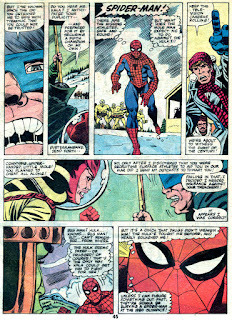 :D I only wish there was an option to open all the pages in a group n' click to the next page, etc. :/ because, as it is, my next best only options are to open multiple pages/tabs or keep clicking back & forth waiting for the pages to reload :P but a minor quibble...thanks again & i can't wait to sit down & read this particular larger-sized treasure :) ...happy x-mas! 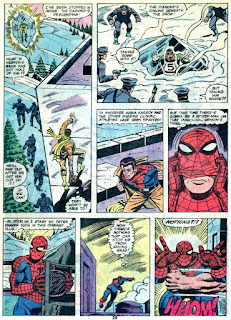 Hope you had a Merry Christmas groove. 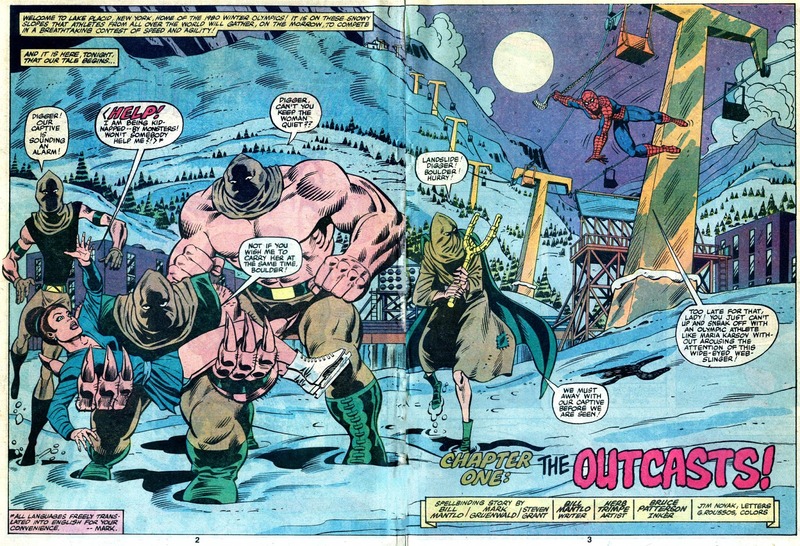 I remember buying this off the magazine rack at a grocery store when I was in the 6th grade. 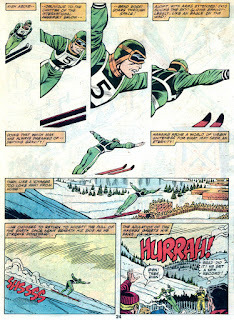 Still have it and in great condition.